A natural tooth consists of a crown, and a root. The crown is that part of the tooth which can be seen above the gum tissue. The root is hidden under the gum tissue, and within the bone. It is the root which secures the natural tooth to the jawbone. In order to replace a missing tooth, your doctor must re-create the crown portion, and choose the best method for affixing it within the mouth. Dental implants were developed for this purpose. 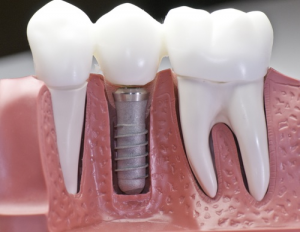 Replacing a missing tooth with a dental implant sounds like an imposing and difficult treatment. In fact, the process can be simple. Implants are placed into the jaw and left buried for three or four months for them to take to the bone. After this time the implant is uncovered and a post and provisional restoration or clip attachments are fitted. After two or three weeks the permanent restoration is fixed. There are several types of restorations that can be used over an implant. The first is a crown, which involves one tooth only and is made of natural shade porcelain. The second is a bridge, which involves three or four teeth over two implants and again is made of high strength natural shade porcelain. The third is a full denture, which is made with special attachments that go over the implants. Before proceeding with implant treatment an examination is necessary to take impressions (to make models of your teeth) and take x-rays to assess your bone level and sometimes a C.T. Scan especially if multiple implants are required. On the basis of this examination, a precise report, treatment plan and quotation is provided. Dr Beresford has gained considerable experience in the design and material use of the abutment (i.e. the post that screws into the implant) so that the permanent crown looks like a natural tooth. The Beresford Clinic is a registered laboratory with an abutment milling centre in Sweden.